There is a place in Rome that most visitors will visit at least once. The place is always teeming with people, even until the late hours of the night. Considered by some as the city center, it has been a favorite meeting point, ("meet you at the Spanish Steps"), for generations of tourists. The Spanish Steps (Scalinata di Spagna) is on the Piazza di Spagna, one of the stops on Metro Line A. You come out of the Metro right on the Piazza, which is almost completely encircled by buildings, and right at the center you see the Fontana della Barcaccia (Fountain of the Ugly Boat) done by Pietro Bernini, the father of the more famous, more prolific Gian Lorenzo Bernini. Apparently commisioned to remember the great Christmas day (1598) flood, when legend has it, a barge was washed up from the Tiber to the Pincio Hill right beside the Piazza. This fountain has supplied clean drinking water for generations and is one of the grander drinking fountains you see all over Rome. The Piazza has a notably international favor, including but not limited to the tourists that flock there. The Spanish Embassy is located here, the Trinita dei Monti at the top of the steps is a French church, and looking around you see Babington's Tea Room, the Keats' and Shelley Museum, a store called Byron and of course that ever present American fast food chain, MacDonalds! Facing down the square, opposite the Fontana della Barcaccia is the Scalinita di Spagna, the Spanish Steps, a grand and imposing rather flamboyant structure. Climbing the steps is surprisingly easier than one anticipates. Since the steps are widely spaced, the ascent is gradual. There are 3 flights of stairs and 3 landings, an allusion, they say to the Holy Trinity . There are 138 steps which brings you up a rather steep slope from the Piazza Spagna to the Piazza Trinita dei Monti, the square upon which the Church of Trinita dei Monti is built. From there, you climb a few more steps to the front of the church and finally, you are rewarded with a panoramic view of Rome and the Via de la Condotti, Rome's most famous street for high end shopping. ﻿﻿ The steps are usually full of people, many choosing to sit on them, having their pictures taken, drinking, eating or simply resting. Going down the steps is accomplished in a zigzag pattern in order to avoid groups of people simply sitting and watching other people, simply sitting and watching. 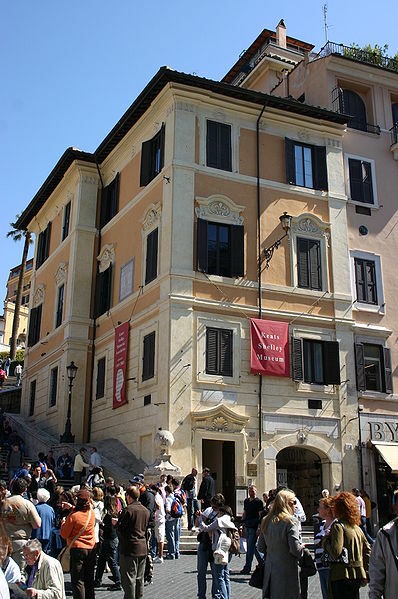 Of several interesting places to visit around the Piazza di Spagna, I chose to go first to the Keats' Shelly Museum. After seeing John Keats' final resting place at the non-Catholic Cemetery, I was moved to find out more about his days here in Rome. When Keats arrived in Rome in November of 1820, hoping to recover from tuberculosis, he was already gravely ill from a disease that killed his mother, his younger brother Tom and eventually, after Keats, his older brother George. He was accompanied by his friend, the painter John Severn. Keats Scottish doctor found them rooms in an apartment in Piazza di Spagna in what was the English quarter at the time. Keats and Severn shared the apartment, on the second floor, right beside the Scalinita de Spagna with their landlady. From his apartment window Keats could look out onto the steps and the piazza below. Keats rarely left this apartment, except upon his arrival when he was feeling well enough to venture out, walking around the neighborhood. After December, he became very ill and died in February 1821 at the age of only 25. His companion John Severn was constantly at his side, caring for him. Nothing of the furniture in the Keats' room of the museum is original, since Vatican law of the time decreed that everything should be burned, the prevaling practice at the time, attached to the disease tuberculosis. The Keats room contains memorabilia including the painting above and his death mask which is found on a table near the bed. In the Salon there are large display cases filled with books which one is free to look at, to read or to use for research. I sat down in one of a number of high backed chairs and looked through a well thumbed book of Keats poems. and with thee fade away into the forest dim"
Ye know on earth and all you need to know! He wrote of beauty, of joy, of youth, of timelessness, of eternity but most of all he wrote of love. And so live ever - or else swoon to death"
Keats' last days in Rome were not easy ones, not only was he dying but he had also left Fanny Brawne, the love of his life back in England. He was depressed, weighed down not only by illness, but also a very sensitive nature, for which "the power of love was life-altering....life threatening." Love is my religion - I could die for that." When John Keats died, he was unknown, in addition his published works had been severly criticized. Sitting there in that room, reading poems that were familiar, poems that were read not only because they were required reading in high school, one cannot fail to reflect on "the slings and arrows of outrageous fortune". Coming out of one's reverie, the sounds of the running water from the Fontana, people's voices and footsteps on the Spanish Steps and even the clatter of horses hooves, (from carriages bringing visitors around the piazza) striking the cobblestone begin to intrude, and a final thought ... sounds (several times magnified) that Keats must have also heard from this window. There are very few places in Rome where you won't encounter hordes of tourists, frantic to take in everything they can before they need to leave. Can't blame them, there's just too much to see. However, with summer's approach, these beautiful, cloudless days are accompanied by the brilliance and intense heat of that Roman sun. Battling the heat and the crowds, can try even the most intrepid of tourists. Finding a quiet, cool place away from the crowds is therefore delightful. I found just that near the Piramide Metro Station (Metro Line B) as I was on my way home from walking the Aventine Hill. The place cannot be missed, first of all because of the landmark right beside it, the pyramid of Caio Cestio, a massive structure at the edge of Via Ostiense, and also because from the top of the walls, (not just any wall though, it's the Aurelian wall, started by Aurelian in 271 BC and completed by Probus in 280 BC) one sees trees, lots of trees! For someone trudging along under a very hot sun, it looks inviting indeed! ﻿ This unlikely place to de-stress is the Protestant Cemetery, a misnomer really as this cemetery is reserved for all non-Roman Catholics of all nationalities and religions. ﻿ ﻿﻿ It's rather poetic, this juxtaposition of the Protestant Cemetery containing modern tombs and the pyramid, the tomb of Caio Cestio, a minor Roman bureaucrat who died in 12 BC. Stepping inside, after dropping a donation in the box at the gate, one immediately feels a tranquility, a serenity. The pyramid, and the tall cypress and other evergreens cast their shadows on neat gravestones. Bushes with fragrant white flowers, which to me looked and smelled like jasmin are scattered here and there. 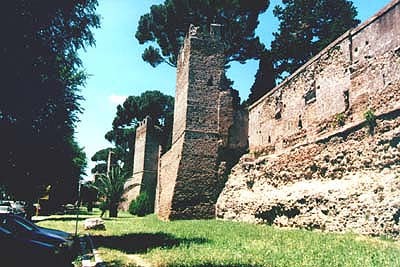 Vines creep up the aurelian wall at the rear of the cemetery. And there is silence, a peaceful, blessed silence, broken once in a while by the tweeting of birds, the footsteps of visitors and the laughter of children, playing in an open area near the older part of the cemetery. ﻿﻿﻿ The lay-out invites one to meander and strategically placed benches encourages one to sit and linger. In addition, a map identifies burial areas of several very important "residents". Most notable being, two outstanding English poets of the Romantic Age, John Keats and Percy Bysshe Shelley. The first grave I came upon was Shelley's. He died in a boating accident off the coast of Viareggio in 1822. It is in the newer area of the cemetery almost against the wall. He is buried beside Edward Trewlaney, who proclaims their friendship in his gravestone. Keat's grave is in the older section of the cemetery, tucked in the leftmost corner. His grave and that of his friend, Joseph Severn and Severn's son are arranged together in a plot planted with flowers and shaded by a tree. There is also a bench against the wall, facing the grave, inviting one to sit and contemplate. It is in the quietest part of the cemetery and very peaceful and beautiful. Fair as Sebastian and as early slain"
It is such a peaceful place that there is a reluctance to leave. And so I sat, lulled by the breeze and the silence, dozing off a little, to be rudely awakened by a rustle of wings, and the cawing of a black crow settling on the arm of the bench I occupied. He stared straight at me, I stared back and then I realized that it was darker, there were no more people around. I stood up abruptly, thinking to myself, "Shades of Edgar Alan Poe"! And so I left, but not before giving another donation meant for the "other" inhabitants of the cemetery.
" The context of this church (capuchin crypt) is so different from the Khmer Rouge Killing Fields display and yet both are about the dead and their remains. One allows us to reflect on the mortality of Man, the other allows us to reflect on the cruelty and insane perceptions of Man." In forcing us to contemplate our mortality, the displays in the Capuchin Crypt had a tongue-in-cheek flavor about them. Those monks had a sense of humor, macabre, it's true but a sense of humor nontheless. 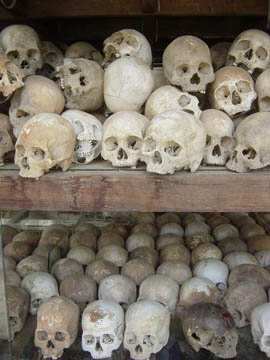 ﻿﻿On the other hand, in the Killing Fields display, reflection on the issue of man's mortality is not even possible, the evidence of man's cruelty and insanity is overwhelming! Waking up on a saturday morning is never easy, it is singularly more difficult in this Italian apartment, with shutters that completely close, not allowing even the minutest of light slivers through. In addition, the weather is beautiful, warm during the day, getting cooler as the sun drops and decidedly chilly at night and early mornings, very conducive for sleeping in! And when you've finally gotten yourself up, another challenge is getting the hubby, who has had a hard week at work, interested in traipsing around Rome with you. My plan for this Saturday was foolproof, promising to have lunch with him at this chinese restaurant in Termini, after we took a look at "something different". "Lunch?" "Chinese?" "Sure!" Whoever said, "the way to get a man to do something is to feed him", must have been a woman! Our destination was the Church of Sta. Maria della Concellazione, along Via Veneto, very close to Piazza Berberini, more specifically the Capuchin Crypt attached to it. The Capuchin Crypt is an ossuary or a bone house, containing the remains of 4,000 monks. First time I came across the term ossuary was in John Connelly's book, "The Black Angel". A good read, but definitely verging on the occult. And in typical John Connelly fashion, his description of the ossuary was vividly macabre! So it was with some misgivings that I walked into the crypt. At the entrance, you are required to give a donation and told to put your cameras and cell phones away, "No photos please to show respect for the dead". (The pictures you will see below are from postcards, which by the way are for sale right there, leading me to conclude that commerce trumps all. ) Then you step into a rather dark, poorly lighted corridor, the left side of which are six small chapels, where the bones of these monks are set into the walls in abstract or Christian patterns. Some bones and skulls are simply piled up to form arches under which fully clothed skeletons in capuchin robes are positioned in various poses. The corridor ends and you have to turn back to leave the way you came in. We then proceeded to the Church, the simplicity of which differentiates it markedly from the other ornate baroque styled churches we had seen previously. This simplicity and the silence of the surroundings is very conducive to contemplation and reflection, something that comes unbidden after viewing what was disturbing, yet fascinating. This contemplation of death, as seen in the crypt, is a common theme in numerous paintings, and sculptures in churches and museums around Rome. Definitely macabre but serving it's purpose, to teach the truth that all men must die and should therefore prepare themselves for this eventuality. As we prepared to leave the Church, I took out my little travel notebook, where I jot down things I want to remember and read again what was written in five languages at the crypt exit "What you are now we used to be; what we are now you will be!"